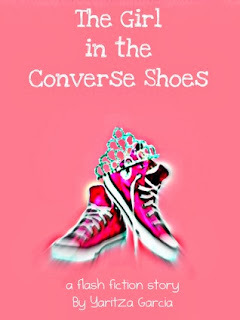 Title: The Girl In The Converse Shoes. In a nut shell: This book wasn't the best book ever, its more of a flash fiction, not a lot too it. Its OK, its not horrible, its just short and I think that was off putting bit. The characters: I can't really tell you much about them, because I'm not even sure myself, but I did learn that I wasn't very fond of the main characters friends, they seemed to be a little... whats the word.... pathetic? Leaving him around, avoiding him... yep- pathetic. The plot: There wasn't much too it, but it was an OK plot. This book could be so much longer, and if it was it might even be a 4* book, because the character sounded interesting, and the situation they were easy to relate too. So its short, and slightly weird, but I think this book is OK! Actually OK! But there were no jokes, or anything, and no emotions just flash bang here you go. Spoilers: A geeky guy gets kissed at a Halloween party by a mysterious person, and then he spends a page trying to figure out who it is, at the end you'll be pleased to know, he does. Notes: So, wheres the rest? I'm curious, maybe even a little addicted.